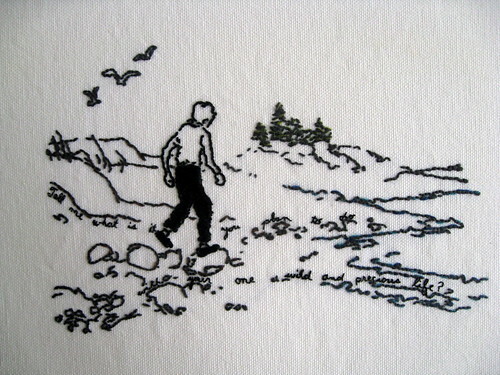 boy on the beach embroidery., originally uploaded by Laura Hartrich. This is absolutely wonderful. I love the stitching and the image. And especially how they are so perfect together. And yes, there is a quote from a poem in there.. can you see the words? boy on the beach. Love it! Been on an extended holiday. Enjoying catching up on everything I've missed at feeling stitchy. What a beautiful piece of artwork! And yes, there is a tale there. Thanks for posting this one, it's amazing! ooh, this one is really special. love the subtle details, and scale. Jiminy! That is just incredible. I love that I never stop being amazed by what other people make. A great find as always ... thanks for sharing it! This is so weird and beautiful and crazy and serene all at the same time (I couldn't pick just one word)... I LOVE this!